Sam Pholirak is a young boy living in Cambodia who had not developed very good spending habits. He often asked his parents for money to take to school and spent it on toys, snacks and other small items without knowing how hard his parents worked to make their money. After attending Cufa’s Children’s Financial Literacy program he has improved savings habits and gained a better appreciation for the hard work of his parents. Sam lives in Boeng Village, Svay Rieng Province, Cambodia with his family – his parents, two siblings and aunt. He is currently studying in Grade 7 at the local secondary school and his put little thought towards his future. His parents work as farmers, growing rice, chickens and pigs, earning enough to save a small amount each month. 2015 was when Sam first received his Children’s Financial Literacy education. He asked his mother if she could buy him a piggy bank to start using to commit to his savings. It wasn’t long before Sam had saved up enough money to buy himself a bicycle. “After I learnt about savings at school and showed my aunt the lesson book she was very encouraging and now I have saved for a bike,” Sam said. His mother continues to give her children 2000 riel ($0.68) to take to school as pocket money. She encourages them to save as much as they can. “I want Sam to finish university, so I always encourage him to study hard. I hope the money he saves every day will help him to achieve this goal,” she describes. Sam is now very optimistic about the future. His ability to create savings goals and knowledge of financial literacy has given him more independence and increased his interest in his education. 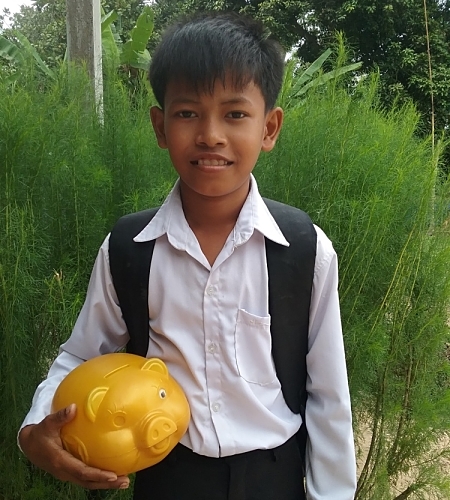 Cufa’s Children’s Financial Literacy program teaches disadvantaged students across Cambodia and Myanmar about developing improved savings habits in a fun and engaging way.